U.S. Sens. Kay Bailey Hutchison and John Cornyn, R-Texas, submitted statements to the Congressional Record recognizing Baylor University’s starting quarterback Robert Griffin III for winning the 77th annual Heisman Memorial Trophy, the first in Baylor’s history. The Senators’ entries in the Congressional Record can be found here. “Today, I know that Baylor University students, alumni, and fans—known as the Baylor Nation—are bursting with pride over the first Bear to win the Heisman Trophy. Congratulations to Robert Griffin III on an incredible season; to his family, who provided the foundation for his abilities; to his teammates and the entire Baylor Nation,” Sen. Hutchison said. “Mr. 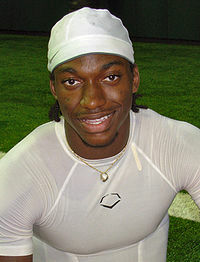 President, on December 10, the most prestigious sports fraternity in the country welcomed its newest member, Baylor University’s Robert Griffin III, as the 77th winner of the Heisman Memorial Trophy. Today, I join with my colleagues, and Robert’s friends and family, including his parents, Robert Jr. and Jacqueline Griffin, in celebrating this fine achievement,” Sen. Cornyn said.